I love Cirque du Soleil (that’s an understatement). To date, I’ve been to five shows including my recent trip to Las Vegas where I saw the Beatles LOVE for the second time. Amazing! That said, I’m pretty excited to share that Cirque du Soleil LUZIA added two weeks to their tour and they’ve arrived in Atlanta! Tickets are on sale here. I had the opportunity last night to attend the media opening and interview two of the performers from the show. This is my review and interview. Cirque du Soleil LUZIA is being called a “waking dream of Mexico” bringing audiences the visual vibrancy Mexico is so well known for. It delivers astounding acrobatic performances as surreal visuals are brought to the stage through a series of environments representative of the diverse cultures and textures of our neighboring country. I love Mexico and its artistic intensity so much! My travels to the Riviera Maya over the years have given me a deep connection to its many cultures. Needless to say, I was extremely excited to experience the journey this show would take us on. I can honestly say I’ve ever been to a Cirque show that wasn’t entertaining. They put in a great deal of effort during the hiring process of their talents, and they have built a reputation for their incredible acts. That said, after having been to five shows, I had to wonder what LUZIA would bring to offer something new in the WOW department. Well, where should I start? From the moment I arrived, it was a tiny robot watering a vibrant garden who made me realize this show was going to be incredible. That was just before bright colors occupied the room and a massive butterfly took flight alongside a mechanical horse. I was awestruck. From what I could see, the audience was as well. And I wasn’t surprised in the least. I know one thing is true when I’m going to see a Cirque du Soliel show, I will be blown away. They have never failed to deliver when it comes to performance and creativity. LUZIA was no different. Act by act I was in awe of the surrealism, talent and death-defying acts. The costuming and giant animal puppets made this show feel like it was a mythical dream come to life. I’d have to say my favorite performance was the rope acrobat who performed in the rain. Water is a big element in this show which is incredible in itself, but to see this performance done in the pouring rain was captivating, to say the least. I had the opportunity to ask two of the performers few questions after the show. My biggest takeaway from this was that most, if not all, of the performers spend their entire lives training for this career. They train for hours every day and get very little free time. The contortionist (above) has been training since he was four years old. He spends about five hours a day stretching and folding. They also apply for the company years ahead of being called in. Some shows are designed around a special performer and that can take a long time to put together. They have an Olympic sized commitment to their art form whci is why they deliver such exceptional performances. 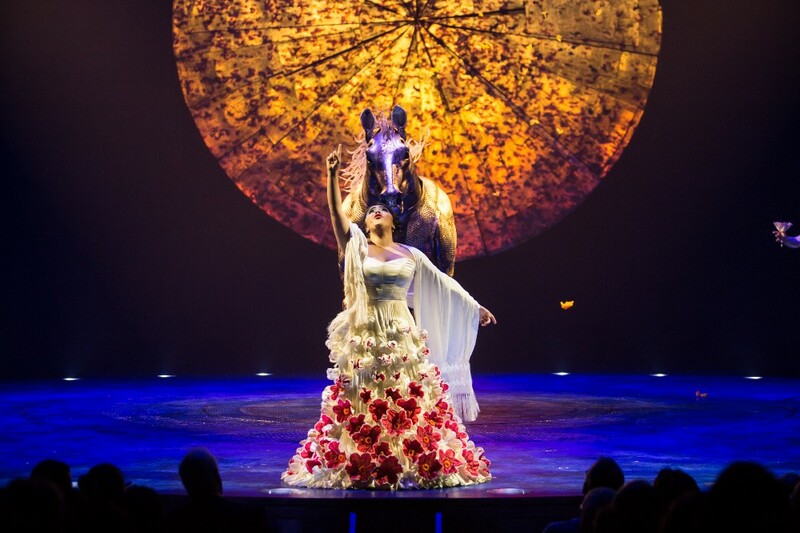 LUZIA is showing now – November 19, 2017, to the newly redesigned white-and-gold Big Top at Atlantic Station. Tickets are starting at $35. Check out these show pics that Cirque du Soleil sent! WOW!